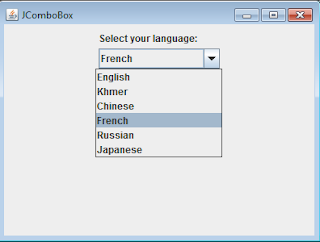 JComboBox represents a combination of text field and a drop down list. You can select a single item from drop down list. In default, a combo box is not editable. An editable field can be made by using the setEditable(boolean editable) method. Below are the constructors and useful methods of the JComboBox class. creates a combo box that its items are taken from an array. creates a combo box that its items are taken from a model. creates a combo box that its items are taken from a vector. adds an item to the combo box. gets the number of items in the combo box. gets index of the selected item. gets the selected item object. removes all items in the combo box. remove the specified item from the combo box. removes the item at the specified index from the combo box. selects the specified item object. In the example above, an array of string languages are defined. This array acts as a data source of the JComboBox component and it is supplied to the JComboBox when its object is created. To perform an action when the item of the JComboBox is selected, you need to register the ItemListener with it and then override the itemStateChanged method. 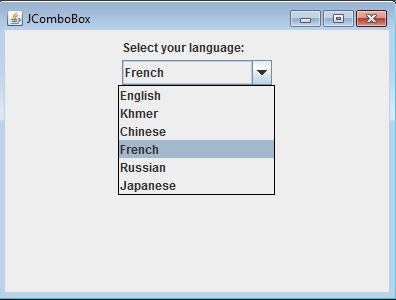 Simply, when an item of the JComboBox is selected, its text displays in the JLabel, lbl.